Posted on January 12, 2018 at 3:40 pm. Paysafe Group has pulled its web wallet services from the Brazilian gambling market, leaving players with limited payment options. 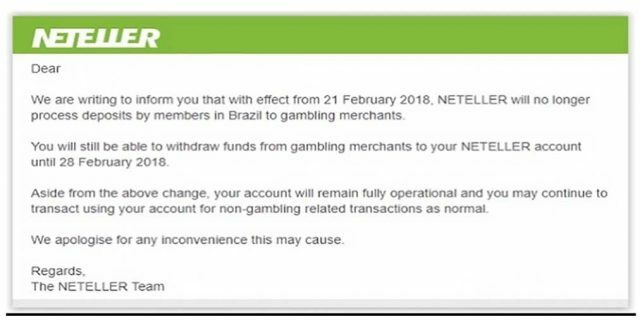 On Wednesday, Brazilian online casino players reportedly received emails from Neteller and Skrill announcing that the company would no longer be processing gambling transactions, according to Games Magazine Brazil (thanks to Google Translate). According to the email, players will no longer be able to deposit at online casinos or other gambling sites using Neteller or Skrill from February 21. Users also have until February 28 to withdraw their funds from their casino accounts to their web wallet. It’s not clear if players can still use the prepaid voucher Paysafecard, which launched in the country in 2017. The announcement is unexpected, given Brazil is in the process of attempting to legalise and regulate online gambling. However, according to the local news outlet, the payment operator wants to be able to operate in the country if Brazil legalises online gambling. Therefore, when Brazil does regulate online gambling, Paysafe Group will likely re-enter the market with its e-Wallet services. But when that will be is not clear. While a Brazilian gambling expansion bill that has been floating around the Senate for the past few years resurfaced at the end of last year, the upper house delayed the December 2017 vote until this year. The country’s president has been looking for new sources of revenue and has stated he is open to regulating gambling services to fill the gaps. The Senate also published results of an online poll earlier this week, revealing around 86 percent of the 2672 respondents approve of legalising online gambling, due to the economic benefits. It’s not clear when the Senate will revisit the bill, or whether a conflicting gambling bill in the lower house will delay a vote. Brazilians can still make deposits with credit and debit card, bank transfers and even PayPal – though it can be hard to find a Brazilian online casino which accepts this web wallet. Punters can also opt for Entropay, a web wallet which works similarly to Neteller and is widely available at online casino sites and bookmakers. There are pros and cons to using the payment method, so always do your research. Payment methods exploding at the moment include cryptocurrencies, specifically bitcoin. Brazilians can use the digital currency to deposit and withdraw at online gambling sites, with more adding the option each day after they have acquired bitcoin and a wallet. For more information, check out our page on all things bitcoin.